On Climate Policy, Romney Walks A Tightrope Republican presidential candidate Mitt Romney has accepted the scientific consensus that the planet is warming up. But he has not accepted another element of that consensus: that humans are largely responsible. His position is well-grounded in politics, but not so in logic. Neither presidential candidate mentioned climate change during their three debates — in fact, the issue is nearly absent from the entire campaign. That's because the issue poses challenges for each candidate. 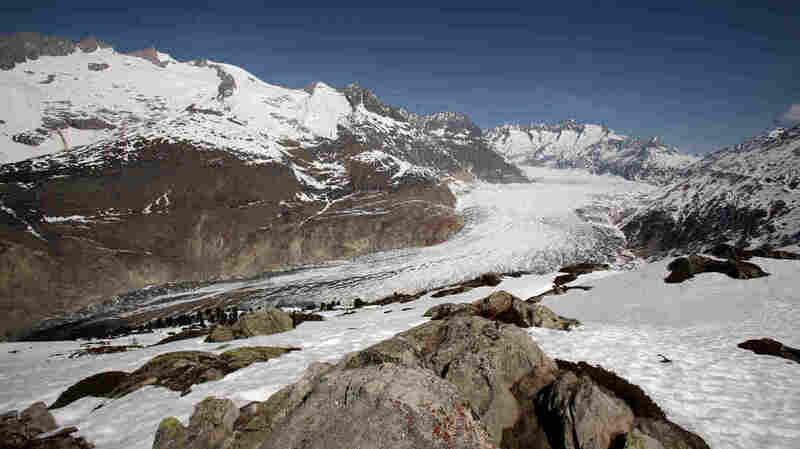 Republican presidential candidate Mitt Romney has accepted the scientific consensus that the planet is warming up. But he has not accepted another element of that consensus: that humans are largely responsible. His position is well-grounded in politics, but not so in logic. Romney rarely speaks of climate change; he has written that he believes the planet is warming up. But why it's happening is another matter. "My view is that we don't know what's causing climate change on this planet, and the idea of spending trillions and trillions of dollars to try and reduce CO2 emissions is not the right course for us," he said at a private fundraiser early in the campaign. In other written comments, he has since said humans play some role, but he hasn't embraced the sweeping scientific consensus — backed by thousands of studies and accepted by the U.S. National Academy of Sciences and its counterparts around the world — that humans are largely responsible. He says since Romney is not a climate expert, he has to make the same decision the rest of us non-experts do. Do we trust the National Academy of Sciences and other experts or not? Gutting says once you decide to trust an expert, you can't just bail out anywhere, as if you were in a cab. "You have to stay for the whole ride that the driver's taking you on," he says, borrowing another philosopher's metaphor. "You can't accept their authority for one dimension of the discussion and then say, well, we'll forget about it for another dimension of the discussion." Logical or not, that's exactly what a lot of Americans do. Anthony Leiserowitz at the Yale Project on Climate Communication finds this factual cherry-picking in his polling data. Some 70 percent of Americans think that climate change is happening, but only about 54 percent of Americans believe it's caused by human activities. Often, people don't even know there's a strong scientific consensus, so they aren't actually rejecting science here. Instead, Dan Kahan at Yale Law School says people tend to base their judgments largely on what their peers think. After all, if you decide to buy a gas guzzler because you don't accept climate change, that decision won't have big consequences for the planet. "It's just not important enough to matter, so it's costless for [people] to make mistakes on that," Kahan says. "But what they believe about climate change can make a big difference to them in their communities. If I go back to New Haven and march around the old campus with a sign that says 'climate change is a hoax,' that's not going to be very good for me in my community." Kahan says it's actually rational for people to reject climate science if their peers are rejecting it. "That's probably not bad for them [personally], although it's not good for society." Looked at this way, it's rational for Mitt Romney to tell his conservative base what it wants to hear about climate change. Leiserowitz says that at least makes sense in the current political climate, which is different from what it was during the last election. "Four years ago, John McCain, the presidential nominee of the Republican Party, had been the primary champion of climate change action in the U.S. Senate for over a decade," Leiserowitz says. Romney was strongly in that do-something camp when he was governor of Massachusetts. But he eventually changed his tune, as he eyed a 2008 run for president and staked out some more conservative positions. Yet Leiserowitz says Romney doesn't want to alienate the majority of Americans, who see climate change as a real issue, so he's shading his language, "and so he's trying to walk that tightrope between those two very different positions." That position paves the way for Romney to say he doesn't intend to reduce carbon emissions. The Romney campaign would not provide a spokesperson for this report. But the campaign's domestic policy adviser, Oren Cass, laid out Romney's climate policy at an event at MIT, webcast by E&E TV. "When Gov. Romney talks about a no-regrets policy, what he means is the policies that we can pursue, that will move forward, particularly with technological innovation, to find solutions without having negative effects on our economy in the interim," Cass said. In other words, research, but no action — other than rolling back some of the Obama administration's climate policies. That again goes against the consensus of the National Academy of Sciences, which concludes that time is rapidly running out to take action if we are to prevent some of the serious consequences of climate change. But philosopher Gutting says Romney recognizes that scientists don't get the last word here. "He does say this, and he's right about this: In the end, policymakers and the public, and not scientists, have to decide what relative balance of risks and costs they think they can live with." And that plays out in the nation's broader political debate.